Imagine hundreds of kilometres of coastline, small inlets dotted with yachts, untouched beaches where the forest meets the sand, and overlooking this paradise rise beautiful villas. In this region the favoured past time is to relax on the beach. When you’ve had enough of the beach, stroll to a beachside bar to order a beautifully made cocktail, before you lazily walk to your villa overlooking the Mediterranean coastline. I know what you’re thinking, this is Greece, South Italy or maybe even Spain, in fact, the place in question is found in France. To the south of the French Alps, following the coast from Marseille to Nice, beaches can be found that are some of the most idyllic on the planet. These beaches are characterized by bright blue waters that gradually move onto shores of the whitest sand, inhabited by a people of varying lifestyles; from the rich and famous to simple coast town living. Located on the Mediterranean and in the southern regions of France allows this part of the world to remain distinctly warmer than the rest of the country. 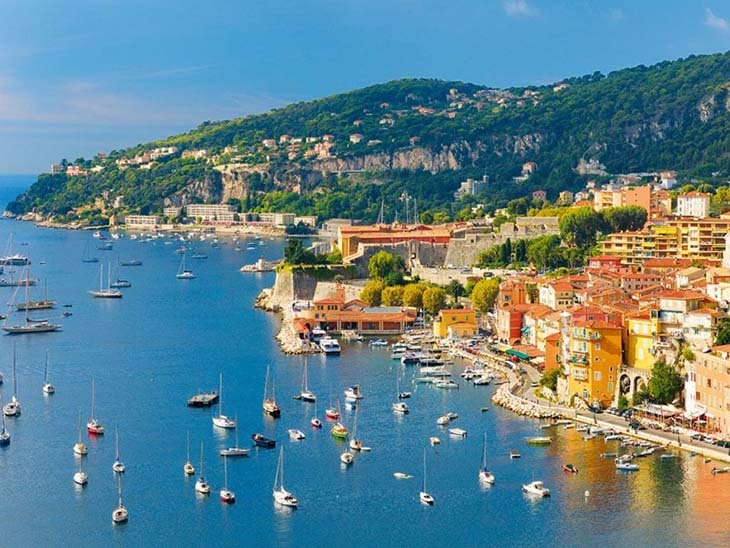 The area is known as the Cote d’Azur to the French or in English, the French Riviera. In many of these inlets and beaches the richest in France spend their weekends on the hundreds of yachts you can see dotted off shore. For the most part much of the tourism in this area is domestic; it is a favourite region for French families to go for a beach get away. While the coast line is not particularly long, a drive between Marseille and Saint Tropez is about 5 hours and there are a number of amazing places to stay along the way. Marseille is where we start this journey, this bustling port city is actually the second largest city in France outside Paris and is a beautiful mix of old and new. A favourite thing to do in this city is wander through the Le Panier, this area embodies the cultural heart of this city. This trendy area is made up of small lanes hiding small cafes, workshops and galleries, days can be spent meandering through eclectic laneways, drinking coffee, seeing artworks and enjoying the sea breezes. While in Marseille a good place to stay is the Vertigo Vieux-Port Hostel, this recently renovated hostel offers a comfortable friendly stay in a convenient location. They can be found at 38 Rue Fort Notre Dame, Marseille. Going further down the coast you suddenly find yourself surrounded by forest. You can hear waves crash as you make your way through the forest to a isolated beach, littered with debris from the encroaching forest making you feel like you’re a million miles from society. The only notion you have the outside world are all the beautiful people around also enjoying the beach. These are the Saint-Tropez Beaches; these beaches were made famous in the 1950’s appearing in a number of movies as places of great beauty. Even to this day they are not overly built up and offer a nice break after the bustle of Marseille. After you’ve had a rest in the relative wilds of Saint-Tropez it’s time for a bit of opulence as we head to Cannes. Hosting the Cannes Film festival is this town’s main claim to fame, but overall this is a city of beauty sitting along arguably the most beautiful part of the coast line. This is the playground of the rich and beautiful, with fancy bars and houses lining the pristine beaches. Recommended activities in Cannes? Grab a cocktail at one of the many beach bars and try to look at chic and hip as possible, go out for the night in any number of the coolest clubs and recover by spending the day on the beach. Rinse. Repeat. Being such an affluent town it can be a little hard to find reasonably priced accommodation, luckily in Cannes there is the Hotel Les Tourrades. This friendly establishment offers a pleasant stay at a really great price. They can be found at Avenue Saint Exupery, Cannes. Our final stop is somewhere many people feel is just a very nice place, this city of Nice (pronounced neese) that is. A word to the wise though, puns made by English speaking visitors are punishable by law (just joking but please don’t do it). Nice is a popular metropolis and in a way good way to finish this trip. It combines the walking café culture of Marseille, with the beaches of Saint-Tropez and a bit of the class of Cannes, allowing you to take in your favourite parts of the French Riviera. An added bonus of Nice is being able to take a trip in Monaco; this tiny sovereign state very close to Nice has the famous Monte Carlo Casino if you’re feeling lucky. Victoria House Hostel is a great place to stay in Nice, they are in a great location, affordable and have an emphasis on socializing. They can be found at 6 Rue Docteur Jacques Guidoni, Nice. What should I expect? When should I go? While this coastline doesn’t cover such a huge expanse you can still easily spend two weeks going between beaches and towns and at each one be pleasantly surprised with the differences in culture, while still enjoying consistently magnificent beaches. The best time of year to take this trip would be through summer as you can take advantage of the beaches although it will be very crowded. If you want to beat the crowds mid to late spring is also a viable option. If you plan on starting in Marseille the easiest way to get there is to fly, the airport there is a major international and domestic airport and flights from all around the world arrive and depart daily. The cheapest and easiest way between all these towns is by bus, because it is all in a relatively small space the bus trips are never more than 3-4 hours.